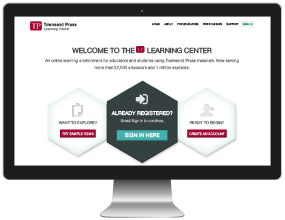 Great news—we just released upgrades and a new subscription option to the Learning Center! Subscribers and licensees get this new content at no charge. With your Learning Center instructor account, you do too. SHORT VERSIONS offer a concise, lower-priced alternative to the full-length books. New 5th edition SHORT VERSIONS of Building Vocabulary Skills, Improving Vocabulary Skills, and Advancing Vocabulary Skills have arrived. 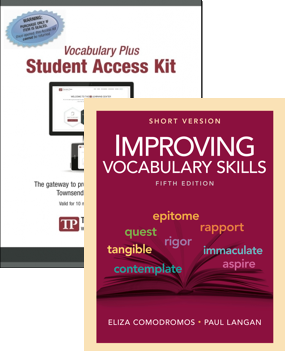 Vocabulary Plus has been updated to include new material for these titles. In addition, new eBooks now appear alongside the previous editions in classes using these texts. Ten Steps Plus brings a full suite of digital materials right to students' fingertips. Mastery Tests and Alternate Mastery Tests for all levels of Ten Steps Plus have been updated. In addition, we added 40 new Alternate Mastery Tests as well as Combined Skills Tests to our two Groundwork titles. Finally, we've revised exercises for Ten Steps to Building College Reading Skills. Exercise updates for other Ten Steps books are coming! 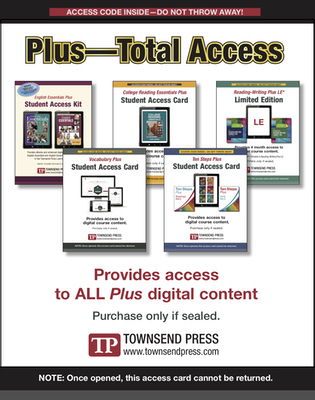 Plus—Total Access is a single all-in-one subscription to all Townsend Press digital content. Looking for a single subscription that grants students access to everything in the Learning Center? You found it. 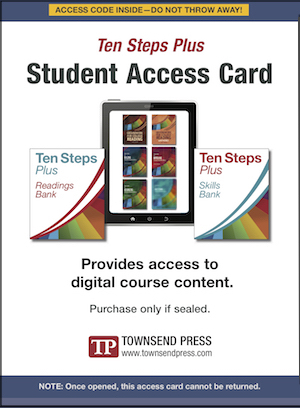 Plus—Total Access includes access to all Townsend Press digital material, including 18 electronic textbooks! Priced at $45 (for 6 months) or $60 (for 10 months), Plus—Total Access offers savings and convenience over subscriptions purchased individually. All new Ten Steps Plus and Vocabulary Plus items are compatible with previous assignments and can be used immediately. Other features and upgrades are in store. If you have questions or would like more information, please call (888) 752-6410 or email support@townsendpress.com. Newer English Essentials Plus is Being Upgraded. Introducing...English Plus! Older Plus—Total Access is here!